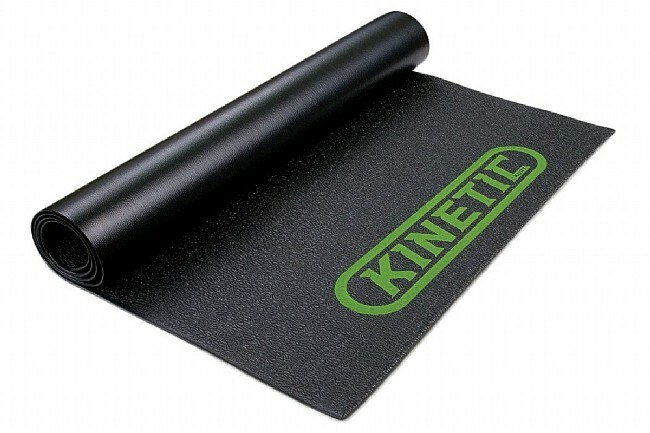 Keep the pain cave clean by setting up your trainer on Kinetic's closed-cell PVC Trainer Mat. It's grippy, durable, and also damps trainer vibrations for quiet indoor ride sessions. Dimensions are 36” x 72”. I have used this trainer mat now for several weeks and it is as advertised. When it gets covered with sweat its very easy to clean with a damp towel or take it outside and hose it off. It does seem to help dampen some of the noise from my trainer. Hopefully it will last for a few seasons. I tried couple of mat and nothing comes close to the quality of the Kinetic Trainer Mat. Very durable and long to provide more space for any type of trainer that you may have comparing to the other Bike Trainer Mat.